Guest Guardian is easy to set up to accept bookings, all you need is a simple link from your web site. And all the pages can be customised with your own photo and colours, so guests will not even notice they've left your site. With one click guests can see which rooms are available on which dates, making it easier for them to plan their trip and therefore making it more likely they'll book with you. If they hold the mouse over a room/date the price is displayed. It's easy for you to hi-light special events and dates using the events options. 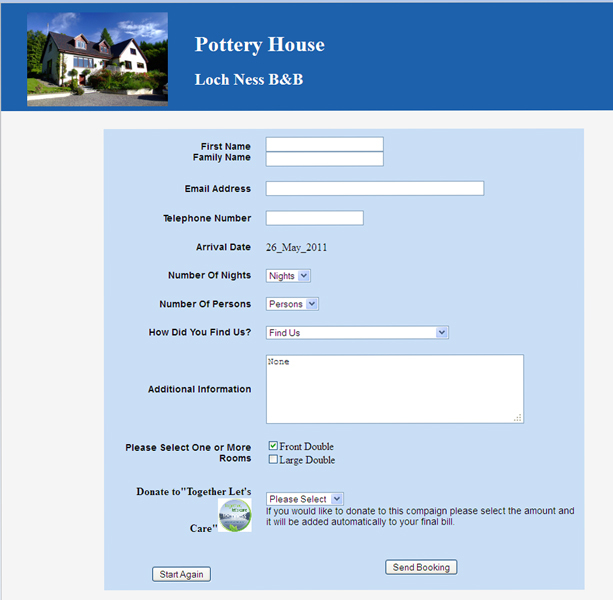 GuestGuardian lets your web site visitors easily book online. Just a few personal details and the booking is all it takes. Simple for people to use. And becuase GuestGuardian is so easily customisable the booking pages can match your own website. GuestGuardian uses PayPal to process credit and debit card payments, so you can accept card deposits but you don't have all the expense and hassle of setting up an EPOS machine and a merchant account. In fact GuestGuardian will manage the whole booking process, it interfaces with PayPal so it knows when the deposit payment has been received and will record details of the payment. You can even let GuestGuardian automatically send a booking confirmation when the deposit is paid.